Eight Simple Truths to Boost Your Carer and Your Life. This is a quick read that I found very inspirational. 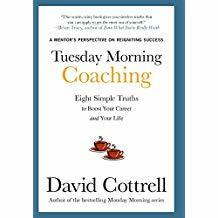 It is told as a story of the author meeting with a mentor Tuesday morning’s for 8 weeks and each week was a lesson on how to improve his work and personal life. Here are the key points made that are elaborated on in the book. Knowledge Is Power – be a lifelong learner. I feel like I already do much of this but this book has helped me focus and reinforces the good stuff I am doing…and will continue to do. The other lesson I thought that was insightful is “Do something different each week”. This is challenging and a great way to learn. Most people who are unhappy in life are unhappy because they don’t have goals or a sense of purpose. Multitask only if you want to multiple things poorly at once. It’s okay to fail – everyone fails at some point – but it’s not okay to keep failing.